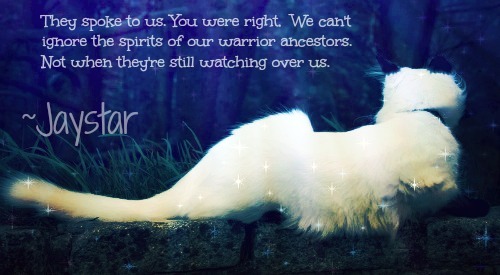 StarClan are the deceased warrior ancestors of the Clans who live on in spirit form after dying, and watch over the living Clan cats. There is no specific leader for StarClan, since there are many cats from all four Clans that work together. They are responsible for sending signs and omens to the living cats. StarClan are the deceased ancestors, descendants and Clanmates of the Clan cats. Cats are only allowed to join StarClan when they die if they have lived an honorable life and followed the warrior code. StarClan cats don't have to be in a Clan at the time of their death to be welcomed to StarClan, shown in Bluestar's Prophecy, when Pinestar was in StarClan, despite him being a kittypet at the time of his death. When a Clan cat dies, they will be guided to StarClan by a deceased cat who played an important part in their life, such as a mentor or a cherished family member. When a cat dies and goes to join StarClan, they merely close their eyes and reopen them. When a leader loses a life, that life appears in StarClan as a very faint copy of the leader, but they are unable to communicate in any way to other StarClan cats until the leader loses their final life. StarClan cats leave starry paw prints, their eyes shine like stars, and their pelts glow with a strange light, which makes them look like they have stars in their fur. Frost sparkles at their paws and glitters in their eyes. Their pelts shine like ice and carry all the scents of the seasons: the tang of leaf-bare, the green scent of greenleaf, the musk of leafall, and the sweet blossom of newleaf. The cats' spirits remain in StarClan until they are forgotten by all living and dead cats over a long time and earned their own peace, causing them to fade away to little more than ghost-like images of themselves. It is possible for a StarClan cat to be killed again, but they vanish forever; going to a different place. StarClan act somewhat like guardians to the living Clan cats, often warning them of dangers ahead, or to guide them in times of need. Ancestors usually watch over the living cats of their former Clan, and especially over cats who were close to them in their lifetime; for example, Spottedleaf generally gives advice to ThunderClan cats, but most often to Firestar. Living cats visit StarClan in their dreams, although StarClan cats are able to appear even in the waking world, but such appearances are rare. Medicine cats are specially bonded with StarClan, and they are the cats who are usually contacted by the ancestors. At every half-moon, the medicine cats and medicine cat apprentices of each Clan go to their sacred place, the Moonstone or Moonpool, to speak with their ancestors, to seek advice or to learn of things awaiting in their futures. To receive the signs of StarClan, medicine cats either touch their nose to the cold surface of the Moonstone, or drink the cool water of the Moonpool to initiate their dreams. Besides medicine cats, StarClan cats sometimes send messages to leaders. Firestar is known to have received several warnings and prophecies, warriors, though it is uncommon, are known to have received prophetic dreams, such as when Brambleclaw is invited to undertake a quest, or even non-Clan cats such as Smudge, when Cloudstar wanted Firestar to rebuild SkyClan. Other creatures, such as Midnight the badger, may also be given a warning or prophecy for the Clans. All Clan cats give thanks to StarClan after catching prey for the life the prey has given to feed the Clan. All Clan ceremonies are believed to be supervised by StarClan. The Clan leader performing a ceremony calls upon the warrior ancestors, and promotes a cat to their new rank by the powers of StarClan.The leader asks that StarClan welcome them by a new name, such as when a kit is named an apprentice.